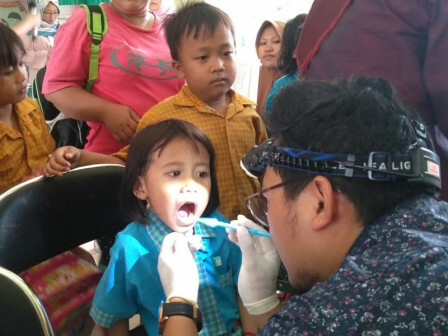 Harapan Mulia Children-Friendly Integrated Public Space (RPTRA) on Jalan Suka Mulia VII, Harapan Mulia Urban Village, Kemayoran, Central Jakarta, opens free dental checkup for children. This service is held by Faculty of Dentistry (FKG) of Yarsi University through Free Dental Checkup for Children event as a part of Community Service Program (PPM) in the university.
" Besides free dental checkup, we also educate children and parents about anatomy of the oral cavity and how to clean it"
Free Dental Checkup for Children Committee Chairman, Chaerita said, her side cooperates with Harapan Mulia RPTRA to hold this event. In this service, her side has served 54 children from 9 AM to 11 AM. There are eight college teachers and seven college students who checkup those children's teeth. "Besides free dental checkup, we also educate children and parents about anatomy of the oral cavity and how to clean it," she mentioned. Harapan Mulia RPTRA Coordinator, Dian conveyed that her side supports communities who want to hold positive activities in RPTRA. "We help them by socializing this event to the locals. We are glad residents can be benefited through this event," she stated.